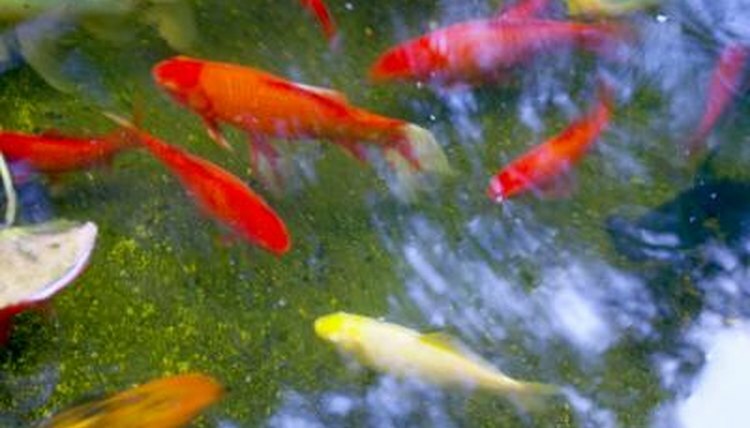 Goldfish and koi have compatible feeding requirements and often thrive when housed together in outdoor ponds. Still, some important factors come into play that affect when and how to feed them, as well as the type of food you choose to use in your pond. Goldfish are excellent scavengers and, if you have sufficient plant growth in the pond, they will get a large percentage of their daily nutrition from algae and green matter. Provide a high-quality goldfish food once or twice a day. Koi are not natural scavengers, so they need to be fed a high-protein food that is formulated specifically for koi. Optimally, koi should be fed two to four times a day, since their stomachs cannot store any food. In general, goldfish and koi should be fed the same amount of their respective foods. Only feed as much food as the fish can consume in three to five minutes at each feeding. Excess food will rot in the pond and become toxic to the fish. Keep in mind the temperature and season when feeding your fish. Both goldfish and koi have trouble digesting food in cold water, so always gradually reduce the amount of food, then eliminate feedings when the weather dips below 47 degrees. The fish will live off of the algae in the pond until their metabolisms completely shut down for hibernation mode in the winter months.